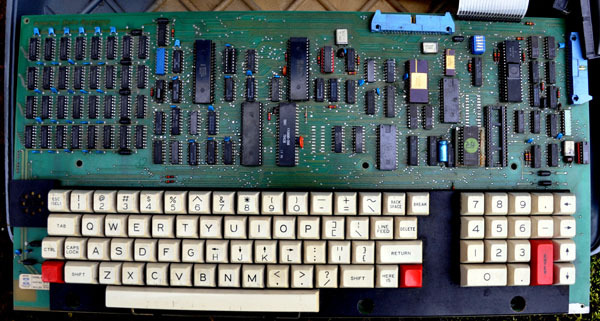 The SUPERBRAIN was a single unit with keyboad, monitor, floppy disk and hard disk all built in. It weighs 23Kg, not something to move too often. It ran the DIGITAL RESEARCH CP/M-86 Operationg System and Microsoft Basic-80 and Microsoft Fortran-80. Rear view. From the left: the POWER switch, 25 pin socket RS232 MAIN PORT, 25 pin RS232 socket AUXILLARY PORT, BRIGHTNESS control, and end of fuse holder. There is an add on switch labelled MICRONEX on the right, more about that later. Just four screws released the 4Kg moulded cover to reveal the inside. The full width mother board includes the keyboard and numeric keypad. 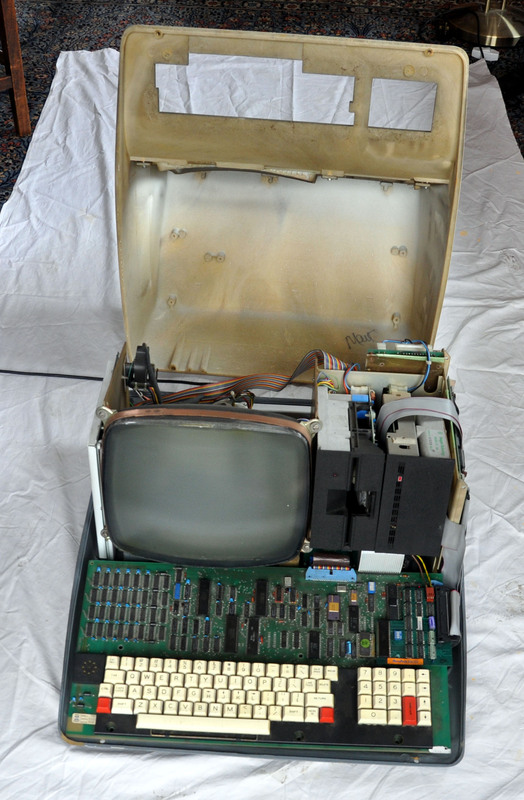 Note the white metal plate to the left of the CRT. Above the motherboard is an 12" CRT 24 x 80 characters, 5¼" 180KByte floppy disk, and the Seagate ST-506 5¼" 5MByte hard disk drive. A closer view of the motherboard. 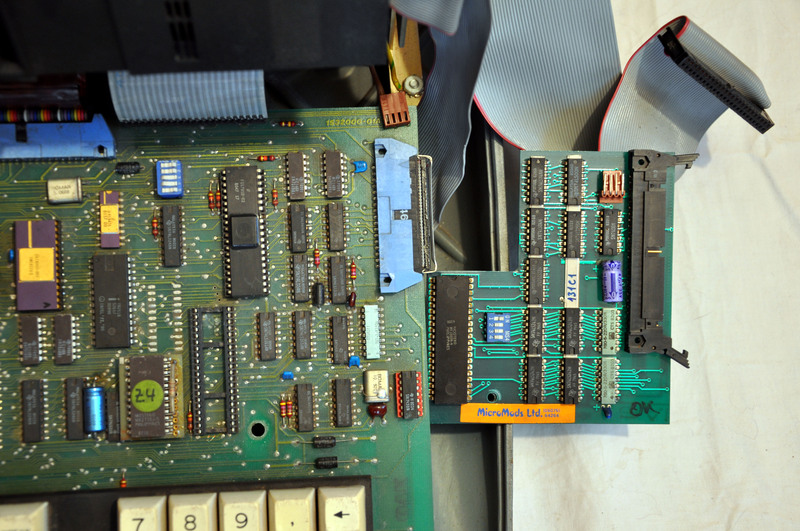 On the left is an array of 4 rows of 8 chips, this 64KByte of RAM. To the right is a big 40 pin chip MOSTEK MK3880N-4 it is 4MHz Z80-CPU. The next 40 pin chip INS8225N is a programmable Peripheral Interface that functions as a general purpose parallel input/output interface. The next 40pin chip KR3600-056 I can find nothing on the WEB about it. 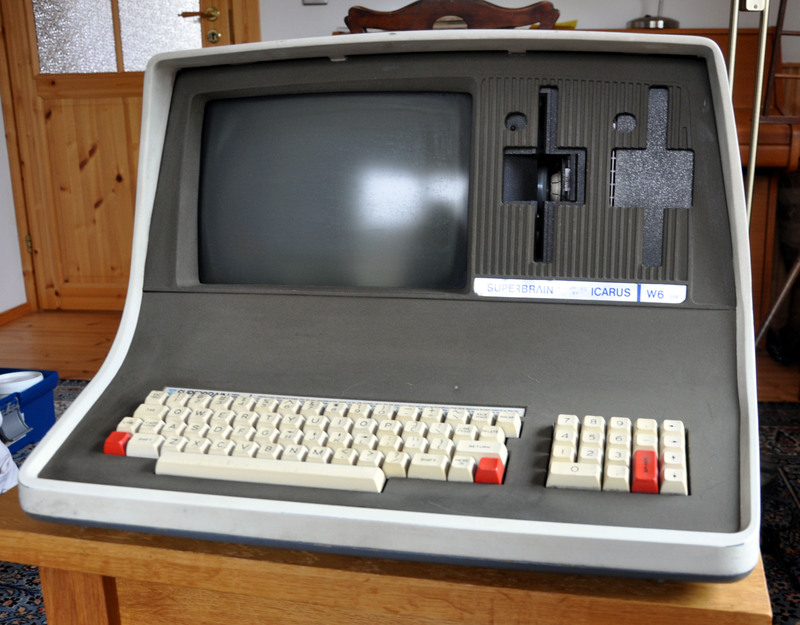 The next 40 pin dip DP8350N brings up in a WEB search "Video Output Graphics Controller - CRT Controller". The 28pin P8251A is a Universal Synchronous/Asynchronous Receiver/Transmitter chip. (A SuperBrain was the first computer to use KERMIT protocol to transfer information to another computer. KERMIT is a backronym of " KL10 Error-Free Reciprocal Microprocessor Interchange over TTY lines." The final 40pin chip FD1791B-02 is a floppy disk contoller. At the end of the motherboard was a daughterboard. 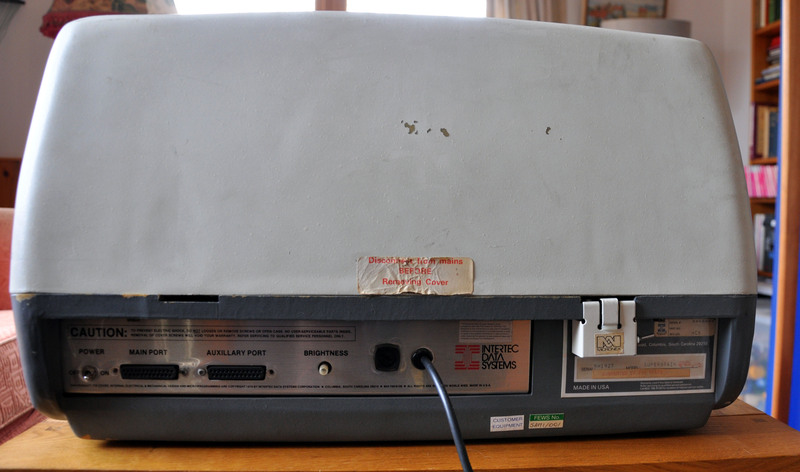 It contained another Z80 CPU and was the hard disk controller. This is a view of that white metal plate. 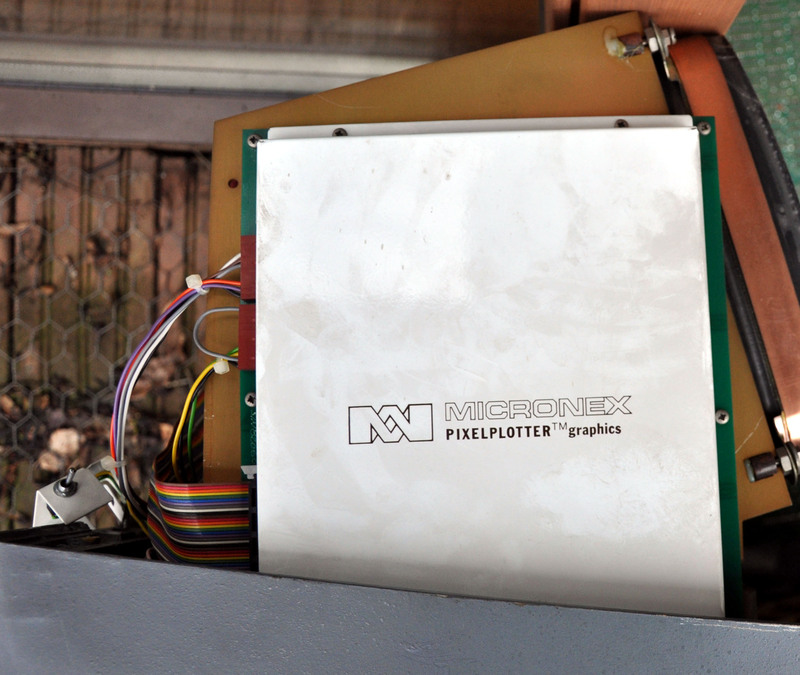 Like the switch on the rear it has the name "MICRONEX" and the text "PIXELPLOTTER graphics". Removing the metal plate reveals a board with chips on it, no big chips, the largest is 20 pin labelled SN74LS373N and brings up on a WEB search "Octal D-type Transparent Latches With 3-State Outputs", there are five of them. So there is no microprocessor on this board. Interestingly there is 16 chips at the top labelled HM4864P-2, Googling them brings "64Kbit DRAM". 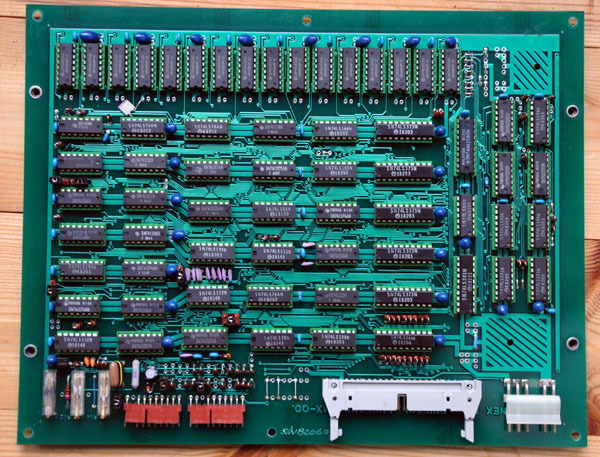 So those 16 chips are 128KByte of RAM, that is twice what is on the motherboard. The original SuperBrain screen was 24 rows of 80 characters, each character was 7 rows of 5 dots. This totals 24x80x7x5=67200 dots. Did the MICRONEX add on graphics card give graphics capability?